E3 2017 – Vampyr Preview – Hippocratic or Hypocritic Doctor? Focus Home Interactive is a French publisher that usually has a large presence at E3. This year was no different. We managed to sit in on a closed-doors demo of Dontnod Entertainment’s upcoming supernatural action game, Vampyr, and if you’re interested in the game, you’ll want to read our preview of the upcoming vampire-themed action RPG. In Vampyr, you play as doctor Jonathan Reid. While in the human world he has taken the Hippocratic Oath and sworn to only help people, as a newly-afflicted vampire, he now has a nearly insatiable thirst for blood. This has given him a terrible duality in his life: does he kill people to satisfy his need, or suffer dearly to save his humanity? The setting for Vampyr is 1918 London, England. The Spanish flu is currently ravaging four districts of the city. It is your job to help the citizens, though whether you pursue that goal is ultimately up to you. The actions and decisions you make will affect other citizens’ lives, in ways both subtle and obvious. 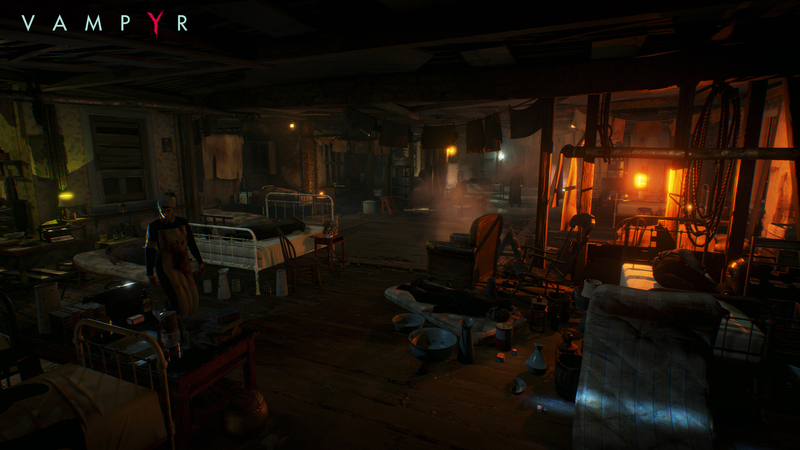 We were shown just a few minutes of the game, but Vampyr does have a skill tree and several RPG elements, as well as featuring action-oriented combat. Jonathan is a fairly skilled combatant, utilizing a variety of weapons, from melee on through firearms, alongside vampiric abilities. While we didn’t see too many of his abilities during the demo, one of the more useful ones on display was called “Spring,” whereby he nearly instantly travels forward to surprise his enemies. The Unreal Engine 4 is being used for development of Vampyr by Dontnod Entertainment, fresh off of their success of Life is Strange. While the demo we saw was running on a PC, the game is releasing on the PlayStation 4, Xbox One, and Windows platforms. The game featured a very dark color palette, and cutscenes with some impressive voice acting work, including one person who had to speak of eating raw flesh in such a way that it could make the hairs on the back of your neck stand up. Creepy! Vampyr looks like a promising new take on the world of vampires. In an industry over-saturated with zombies, this other form of the undead is a refreshing change of pace. Knowing that the game includes multiple endings will also entice gamers to change up their play style in an effort to view them all. Vampyr is currently scheduled for release in November 2017.